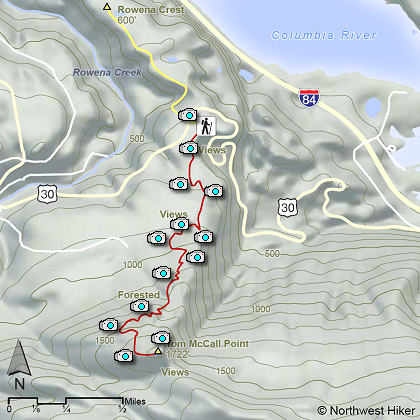 This excellent hike begins at the Rowena Overlook on the Old Columbia River Highway between Hood River and The Dalles. You can hike this trail almost any day of the year. Of course, in the winter that could be a challenge. However, from March thru October this hike provides you with a wonderful variety of landscapes to enjoy. Parking at the Rowena Overlook, you find the trail on the south side of the area and follow it to the top of McCall Point. The trail is fairly level at first, but then climbs steeper and steeper as you work your way up Tom McCall Point. This area is most famous for its spring floral displays. Wildflowers begin showing themselves as early as late February, and by March are in full swing. They just keep getting better and better with each month, until they peak out by the end of June. 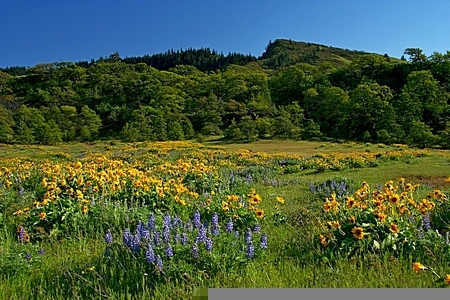 The views as you climb Tom McCall Point are nearly as wonderful as the floral displays. The trail can be slick if it is wet, so be aware. From I-84 in the Columbia River Gorge, take either the Mosier exit (5 miles east of Hood River) or the Rowena exit (8 miles west of The Dalles). From Mosier, go east on the Old Scenic Highway (US 30). Beyond milepost 6, the preserve is on both sides of the highway. Park at the Rowena Crest viewpoint or at the trailhead on Hwy 30. There are two trails on the preserve. One popular trail is closed from November 1st through May 1st due to due the erodible nature of the ash-based soils.